Linda LaRue Blog: It's Monday, What's Your Weight? Are You Like Oprah? It's Monday, What's Your Weight? Are You Like Oprah? It’s Monday. My question to you again during these food-fest eating holidays is, “What is your weight”? Have you gained more than 2 pounds last week or like Oprah, gained significantly more over this past year? Are you a yo-yo dieter? Last week Oprah made a courageous, personal statement about her ballooning weight gain over the past year. She is like many of us, an emotional eater. Her addition is food. She took her focus off her health. 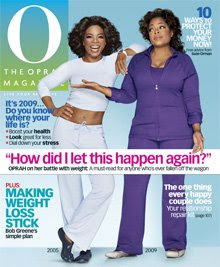 Oprah let her unhealthy emotions dictate her lifestyle choices including how much and what she ate, while letting her exercise routine slide. Her statement about getting back into shape and losing weight by focusing on her self-care is a healthy attitude to develop, because health care is about making your self-care first. It’s why my free online health club at www.LindaLaRue.com is entitled, “Make Healthy A Lifestyle”. My mantra has been to my clients and myself that, “Health care is self-care first”, (especially us women who tend to put are loved one’s needs along with our jobs before ourselves). So I am asking you again this Monday during these eating, food-fest holidays is, "What’s your weight"? If you have gained weight, time to redirect your focus and attention onto you—meaning your health. Lace up your Nike’s, do your Crunchless Abs, watch what you eat including your portions, and truly commit to “Making Healthy A Lifestyle”. It will be the most precious holiday and New Year’s gift you’ll give yourself and your loved ones too.